It's one thing to hire a consultant to come into your offices to give a spunky pep talk or take notes on a flashy flipchart. It's another to hire an expert capable of helping you plan, implement and evaluate everything from corporate goals and programs to projects and processes . . . in a manner that is customized for your organization. Jude is a facilitator, evaluator, trainer, and coach who specializes in working with high-tech companies, academic institutions, and government organizations. To learn more about any of these customized services, visit the contact page. To learn more about Jude, visit her about page. From decision making meetings to team building and business planning, as well as large group facilitation, Jude has a unique ability to facilitate group interactions. Evaluating without bias can be a difficult if not impossible task for most organizations. Jude Heimel has a wealth of experience as an objective, third party assessor. 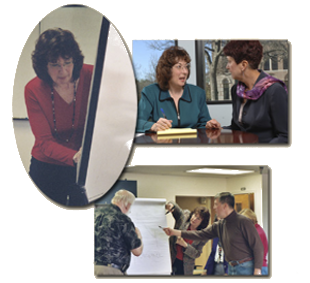 Jude provides training that is developed to meet your organization's needs. Her training courses are innovative and targeted to achieve high-level goals. Jude can help you identify the gap between where you are today and where you want to be. She can help you clarify and achieve the outcomes that are eluding you.